Raw Living, and its plethora of wonderful raw foods, superfoods and supplements, recipes and education are the products of the remarkable Kate Magic and Chris Wood - dedicated leaders in the raw revolution and 'superhealth'. 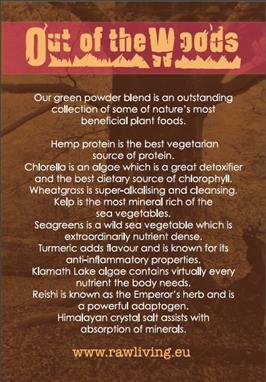 Like Seagreens they have sought to make raw and super foods easy to access and fit in with everyday life and food preparation. A pioneer in this field for over 20 years, Kate is Europe's most experienced raw food promoter and her own 3 sons have been raised on a raw diet. A globally renowned raw food expert, Kate has over two decades of experience of raw eating and is the Creative Director of the Raw Living website. The author of four raw lifestyle books, Kate tours internationally giving talks and workshops on raw foods which showcase her unique blend of fun, down-to-earth practicality and spiritual wisdom. Kate also home educates her three sons, whom she has raised on a raw vegan diet. You can find more of her work at Kate’s Magic Bubble. Kate is the author of four excellent raw lifestyle books including the UK's best selling raw food recipe book 'Eat Smart, Eat Raw' - a new edition is published 2013 by Grub Street, London - and she has appeared across the media from The Sunday Times to The Green Parent and from BBC TV to Passion for the Planet digital radio. Driven by a passion to see humanity at peace and in unity, restoring Mother Earth to a garden paradise, she believes raw and superfoods are important tools which help unlock our inner potential giving us the natural energy to create such a cultural renaissance. 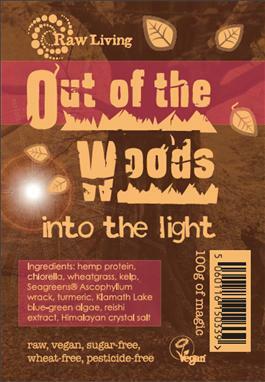 In 'Raw Living' published by Grub Street in 2007, Kate references Seagreens in no less than 7 recipes, and she has included it as a major ingredient in her flagship product Out of the Woods illustrated opposite. You can contact and follow Kate on Twitter and Facebook, on Instagram and her Magic Bubble website. Holly Paige, author of 'Recreating the Psychoactive Forest (Nutrition for Natural Consciousness) said that she had some of Kate's 'Be the Change' chocolate on Christmas day. "I think Kate is the change", she said. "She understands the things that are going on in this world and remains so full of love and lightness and goodwill to everyone". Raw, or one might say living food, and our conscious relationship with it, continues to grow such that, in the same way that vegetarians and vegans were regarded as "cranks" in the era of Flower Power - the famous vegetarian restaurant of that name which first opened in Carnaby Street in 1961 now sells frozen ready meals to Waitrose - raw food is part of the burgeoning culture of food and health in which we can all rejoice and participate. Serves two, 10 mins to make, you'll need a blender. This is one of my favourite lunches. Spread on a nori sheet and rammed with alfalfa sprouts, you couldn’t fit anymore nutrition in each bite. If you don’t have a blender, you can still make this, just crush the garlic by hand, and mash everything up with a fork. Remove the flesh from the avocados and place in a blender. Add the lemon juice, hemp oil, garlic, and Seagreens. Blend to a puree, adding more oil if you need to. Stir in the cacao by hand. Share it with someone who needs cheering up. Serves two, 10 mins to make, no equipment needed. Ooh baby, I’ve got your number. This dish is the epitome of what I am trying to convey with my cuisine: impressively quick and easy, inexpensive, and so nutritious you could live on it. Grind your flaxseeds/linseeds if you haven’t done so already. Cube the avocadoes into bite-sized pieces and spoon out the flesh into a mixing bowl. Cube the cucumber into pieces the same size and add them to the bowl. Stir in the Seagreens, algae, flaxseed, flax oil and crystal salt. Make sure it’s evenly mixed, and serve as a light lunch or tea. Serves four, 10 mins to make plus 12-18 hrs dehydrating, you'll need a blender and preferably a dehydrator. In California in 2010, I had some sweet and spicy kale chips from raw originator Juliano. They had a kind of barbecue sauce on and I don’t know how it was done because I haven’t come anywhere close to replicating their gooey stickiness. He probably used a ton of honey. Well this is what I’ve ended up with, nothing like the Juliano version, but perhaos a little more sophisticated. First tear your kale into bite-sized pieces. It doesn’t really make much difference the size of your kale, the important thing is to remove all the stems because they turn into sticks in the dehydrator. In the blender, put the pepper (chopped into pieces so your blender can deal with it easily) along with the olive oil, honey (or agave), cayenne, lemon juice, and Herbamare. Blend well until there are no lumps of pepper left. Pour over your kale and mix so the sauce is evenly coating the kale. I’ve found it’s best with kale chips if you don’t squeeze the dressing in and wilt the kale, like you might do for a kale salad, but just allow it to coat it. I’ve also found that different types of kale need different amounts of dressing: curly kale seems to absorb the most and cavalo Nero (dinosaur kale) the least. Sprinkle over your saffron and Seagreens, and mix again to sure they are evenly distributed. Spread over three dehydrator trays. You may find you have some leftover liquid (dependent on how big your pepper was), you can either get some more bits of kale to mop it up, or reserve it for salad dressing at a later date. Dry for 12-18 hours. As these aren’t as oily as some of my other recipes they crisp up really well and tend to stay crispier longer. If you don’t have a dehydrator, you can bake these in the oven – I’ve never done this myself, but if you look online you’ll find lots of different recipes for baked kale chips.